It's the week after one of the biggest events in the world / design calendar, Milan furniture fair Salone Del mobile, and roughly a month on from Euroshop Dusseldorf. Coming off the back of an extended Easter weekend, for some a great opportunity to catch up with those side projects or perhaps just sit back relax and consume your body-weight in chocolate. As usual I had big plans for the weekend but work sometimes takes the back seat, so to summarise here is my week in review. 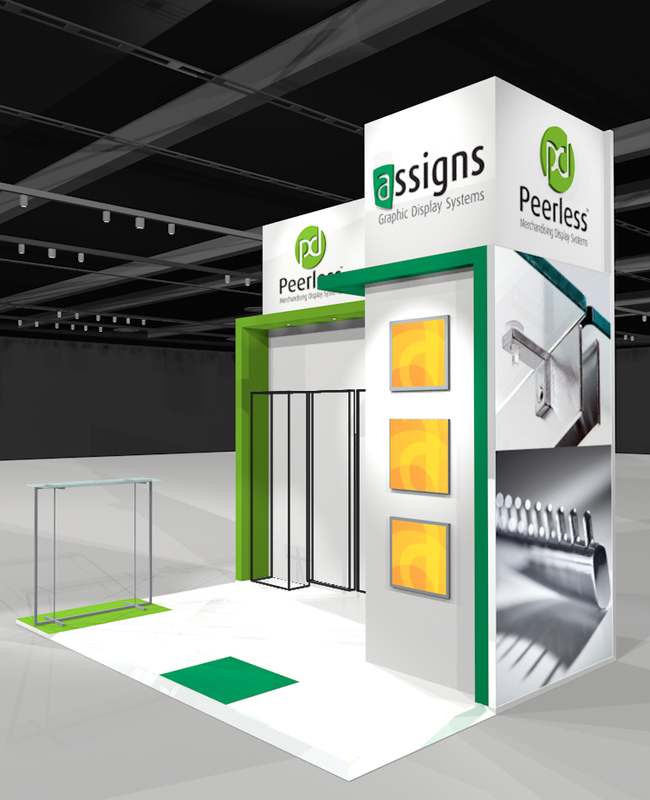 At Peerless we are nearing the completion of our new system launch, and are building up to the crescendo that is exhibiting at Retail design expo, alongside our sister company assigns. Currently I can't say too much about the system itself but essentially it is a new wall mounted vertical hanging system which eliminates the need for timber infill panels and replaces this expense with a printed graphic. I have started rendering the system after spending a day or so modelling all the components and assemblies to make up our set kit dimensions (see below). Danny (Peerless / Assigns MD) had the idea of creating some example bays and elevations to show how the system works and really get the message across to people, as I came to the realisation we had been working on the project with somewhat tunnel vision, presuming everyone would instantly understand its many uses. The only snag we are envisaging when promoting this system at the exhibition, is due to its infancy we haven't had any time at all to take it into a store setting and obtain some hero shots and really get to grips with its benefits. The lighting solutions are being explored and the ability to have a backlit merchandising bay (with an additional fixing kit) is nearing completion, depending on costs, suppliers and sizes etc. An unmerchandised projection of our new system. As mentioned briefly, the exhibition itself is nearing ever closer, all of our standard components are currently being finished and on Friday some landed back in our hands. One of the main finishers we use for plating has provided some fantastic samples to match our 'unorthodox' brief. Which is fantastic because we are looking to expand our own catalogue, since noticing a recent a trend spike; it seems as though the traditional polished chromes, satin chromes and nickel plating are becoming incredibly outdated and somewhat 'tacky'. I believe due largely in part to the pressure retailers are feeling to stand out, which is filtering down to designers who in turn are pushing for more from suppliers. You can visit Peerless / Assigns who are exhibiting side-by-side at the Retail design expo, London Olympia, on the 8/9th of May, stand F75. Projected renders of our exhibition can be seen below, supplied by and copyright of MXL exhibition design. To supplement the exhibition stand and the new fabric wall system we have been developing over the past few months, we will be showcasing a number of units from our comprehensive range. This includes ferrules, uprights, brackets and other standard shopfitting components alongside one of our flagship products the ROTOR frame. A staple of our product range for over 20 years the frame has remained relatively unchanged throughout the years, which in itself is a testament to the engineering prowess it exuberates. My attempts to value engineer this product, bringing it to a more 21st century market hit a snag earlier this week when Danny immediately noticed a gigantic flaw in the rails and the way they connect to the unit itself. To cut a long story short, lesson learned, always model prototypes in CAD no matter how clever you think your ideas are. A day spent modelling / testing is nothing compared to a week lost to redesigning and the monetary expense of a second one-off production. My new product developments have been coming along nicely this week but I haven't had much time to spend on sketching as I would have liked. The slotted post system I've been developing alongside work, is coming along really well. The time consuming part is showcasing the different ways in which the system can be utilised. In the near future the drawing package will go out for full costing, and from then on, priced, to ensure I'm not taking this overboard. So expect to see big developments in the coming 2-3 weeks on that front. I also updated my Instagram this week with an interesting little snapshot of 15 minutes of my day condensed into just over 30 seconds. You can head over here if you want to check that out. I've also updated the display concepts section on my website (for those reading this on medium) with both some new inspiration images and renders of the slotted system. I've also been thinking recently about how to improve the layout of the website and whether it really showcases my work as I want it to, so i'm going to spend some time in my lunch breaks next week exploring potential template changes which may suit. One of my friends, originally commented that I should "let the images do the talking" which is something that has been concerning me recently so it's looking likely I will be moving to a more 'showcasing' portfolio site. I have mentioned before and have been saying to peers for a while now that Zara's retail design philosophy is very interesting. The way in which their new store formats display a 'collection' or 'look' as opposed to areas e.g jeans, shirts and shoe departments is one I am backing to be big. This links directly to the popular customisation trend we've seen major retailers adopting for a long time now, from targeted personal amazon email campaigns to engraved personal iPads. Now we are seeing this being taken to a new level. People are inherently lazy and will naturally take the path of least resistance so a service like www.mylittlebox.co.uk, monthly food parcels from Graze, and even repeat one-click payment Ocado orders are extremely appealing to those front runners living the urban fast paced lifestyle (who generally tend to set trends). In japan commuters can shop whilst getting the train to / from work with a simple barcode scan and an efficient delivery network. Now I know this isn't exactly rocket science but when we start relating these convenience and personalisation theories to physical retail stores, that is when we can start to see a real difference. Companies like Mylittlebox / graze etc aren't the only ones tapping in on this, Asos offer tailored to you, plus and tall sizes and even a 'your recommended size is in / out of stock'; I would argue it's time brick and mortar stores mirrored the online market. The reduced time and lack of physical communication are what fashion retailers, in particular the likes Zara can use to their advantage instead of anguishing. I imagine shoppers of the future going in to store and trying, visualising and then buying a whole outfit. What if consumers don't want to shop around as much in the future as we are predicting, they just want reliability or a sense of community? Maybe they will showroom (a separate issue) but getting them through the door, providing a fantastic service and gaining their trust is going to become more valuable than ever. Of course this is unlikely to work for all fashion retailers as typically the 'cheaper' ones amongst them e.g. H&M and Primark etc are never going to be loved for their quality or durability. Thus making it hard to build a trusted relationship with the consumer that isn't based on anything other than price. Thanks for reading this week in review, I'm hoping to stick with this and make it as regular an occurrence as the title may suggest so check back to the website or sign up to my email list here.